Now an established 5 star boutique hotel, Mirihi is maturing wonderfully well and deserves being better known internationally. The resort has been a bit of a secret among the German-speaking, particularly Swiss, guests since Manta Reisen opened it all those years ago. Now the word is spreading that here is one of the best small resorts in the country. In the classic Maldives style, roofs are thatched, floors are made of deep soft sand and daylight floods in through open sides. With a prominent use of quality timber, and furnishings in ivory, white and tan the effect is calming and uplifting. In terms of service and attitude, something imaginative is in place here, a sort of ‘grown-up hospitality’ - a give and take of respect and trust. Signing for bills is discreet and infrequent. There are no designated seats in the restaurant, guests are free to drop into the staff area, free to pick up cds and movies at the reception, free to take out any watersports equipment. Each room is individually named (for native trees and flowers) rather than numbered. The occupants names are discreetly displayed alongside. Wifi is free in the main complex and charged in the rooms. European and Maldivian staff, many female, are clearly well trained and motivated and deliver an impressive standard of service. The same must be true of the chefs for the food is sumptuous. The dinner buffets are inventive and delicious. Having said that, I may have been unlucky with a fairly ordinary lunch and glass of wine. The over-water speciality restaurant just demands to be tried out. The Muraka serves ‘surf and turf’ haute cuisine in a modern, seductive environment. And once a week, limited to 16 seats, it puts on an extra special multi-course meal with matching wines presented by their Master of Wine. The pleasures of this resort are mostly of the romantic, quiet variety. 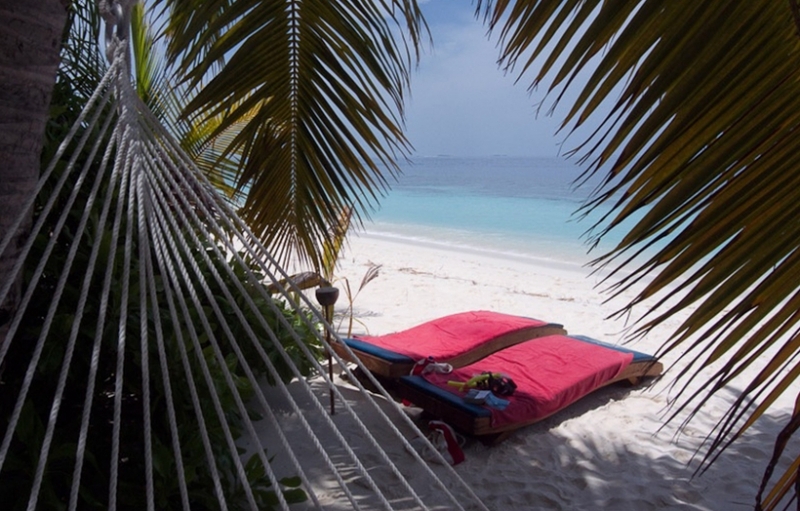 Even the excursions tend that way, with a Castaway trip to a desert island and Champagne Breakfast on a sandbank. If not on your honeymoon here, as many are, you might come to renew your wedding vows in a specially organised ceremony. 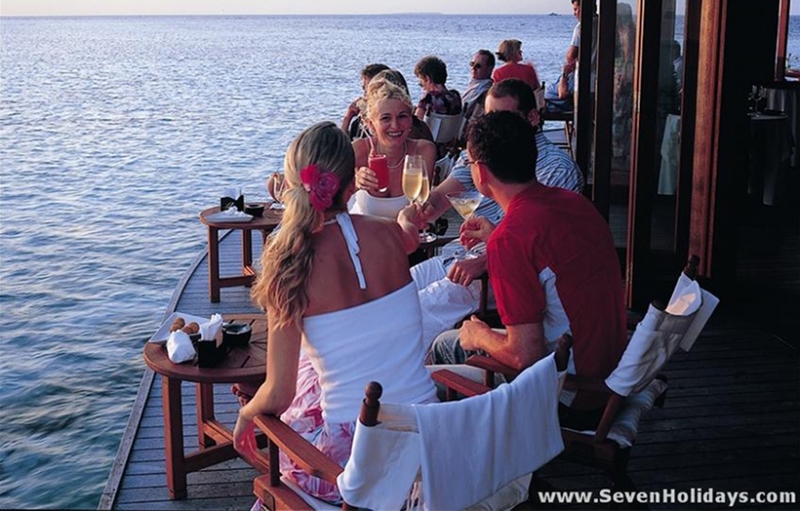 Whatever the situation you should want a completely relaxing and quiet holiday because that is what you will get. There are no evening entertainments on any night. Understandably there are no motored watersports on offer, there’s a large sandy lagoon off one end of the island, which is ideal for the free catamaran and windsurfing. 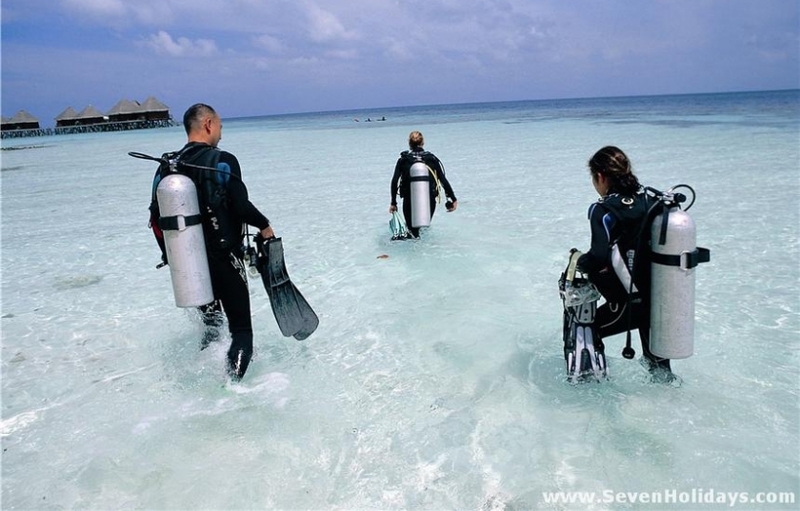 The snorkeling area is not extensive but what there is, is very rewarding. The coral life is far better than most resorts and the fish life is abundant. There are also no strong currents to be concerned about. Diving has been important to the resort since its opening. Even if not as key as it once was, the prominently positioned dive base still ticks over with activity throughout the day. And then there is always Hassan, who has been a divers magnet and a mentor here for 18 years. The island is very fortunate with its location within easy reach of one of the best Manta Points in the country, some of the best thila dives and also the outside sites where whale sharks are tracked. 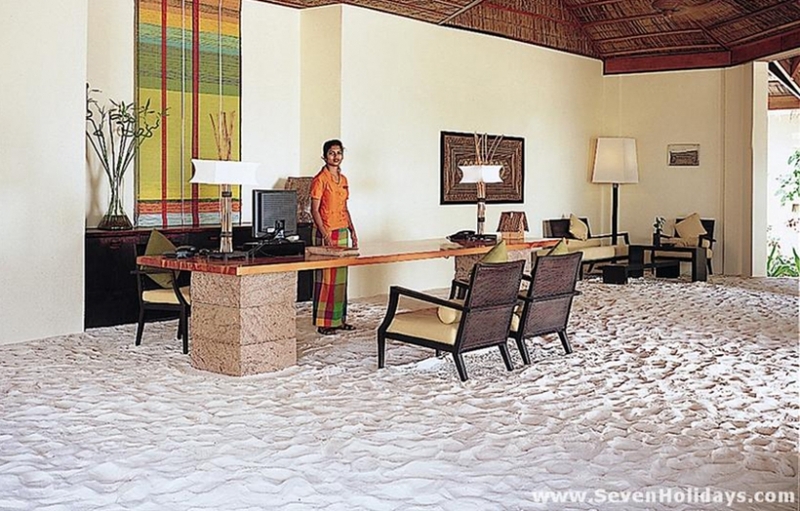 There is a lovely, big beach outside the reception and main bar, at its peak during the high season. The problem is that isn’t where it’s needed. 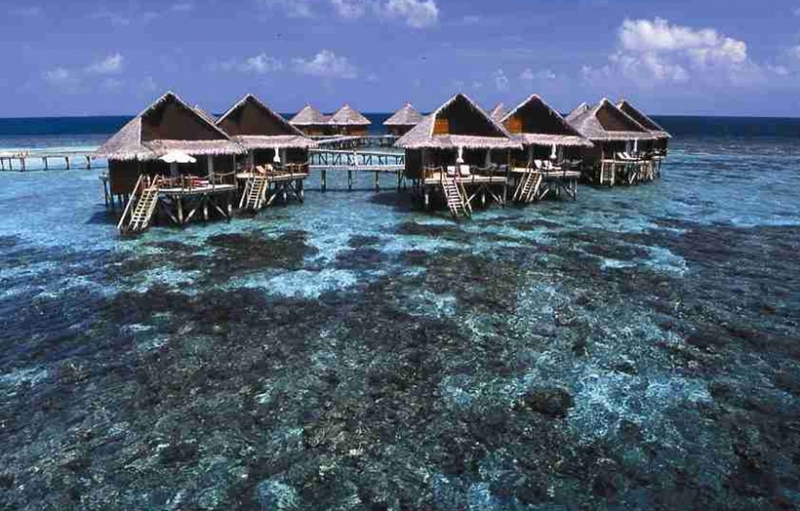 The north end of the island, which has 16 Water Villas off it, develops a beach during the southwest monsoon (off season) but very little during the northeast (high season). There is a decent beach behind the Water Villas on the west side but the rooms then interrupt the view. The beach rooms do have some permanent beach. Having said all that, the island is so small that it’s only ever a couple of minutes to find your place in the sun. 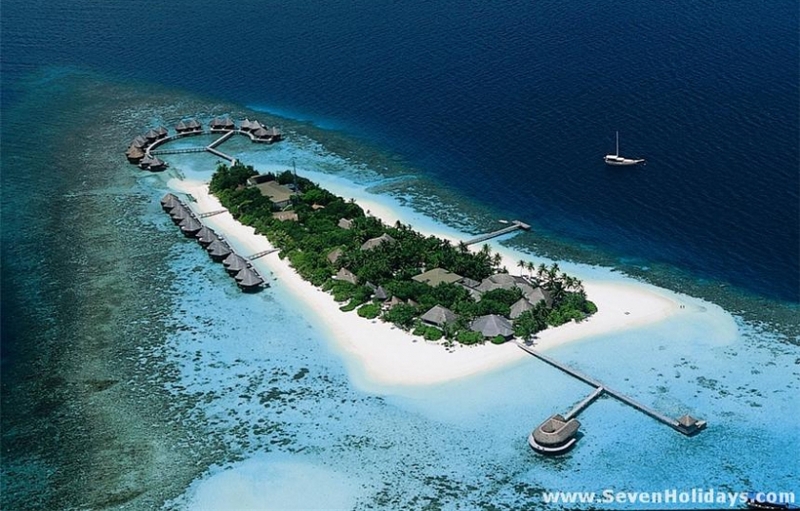 Of the 36 rooms in total, 6 are Beach Villas and 30 are Water Villas, off 2 different jetties. 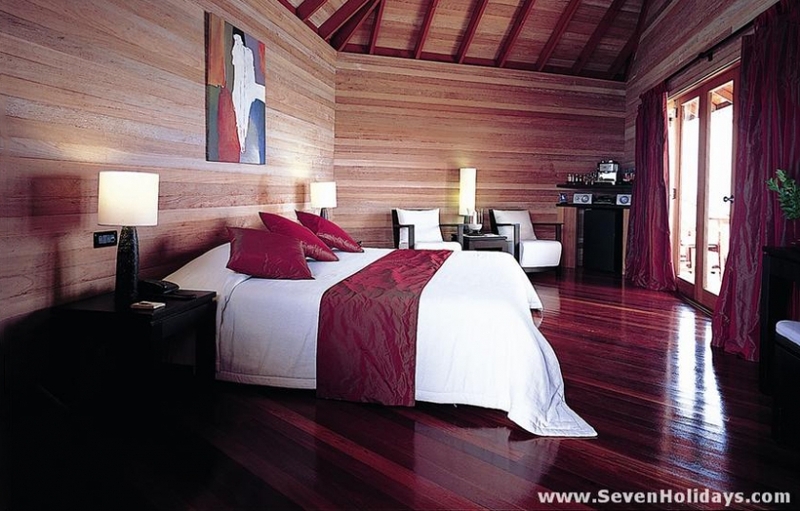 The rooms use wood throughout; beautifully crafted wood, with satisfying variations in colour and finish but the overall effect could be considered too much of a good thing. Neither the rooms nor the decks are large for 5 star resorts but they do have 2 double glass doors that open out fully to give a lovely inside-outside life to the rooms, deck and lagoon. The decks might face west, north or east depending on which room you have. You’ll have to return to get your favourite; they each have something special going for them. Mirihi itself has a great deal that is special about it. There is no question about its position in the upper bracket of small boutique resorts.